Tomato Gratin Stew: Tomato Party Part II and…What Am I? So Stephanie, what do you do? So food world, what’s the new title? The one that hasn’t been invented yet? I’m certainly not the only food blogger out there who is working on a cookbook, organizing events, promoting my local food community, teaching classes, doing media appearances, styling photo shoots, connecting with people through social media, partnering with brands and businesses, and advocating for the simple beauty and incredible power of real food, cooked at home. Food influencer? Food educator? Food maniac? While we think about it, here’s a pitch for an old-fashioned grandma sort of recipe. My friend Imen McDonnell, she of the stunning blog Farmette, tweeted recently about how she grew up eating tomatoes: with cream and sugar. I love the idea, and had it tucked in the back of my mind (waiting for tomatoes to start showing up here, LATE), when I remembered this recipe for Tomato Gratin Stew in Marion Cunningham’s wonderful cookbook, Lost Recipes. 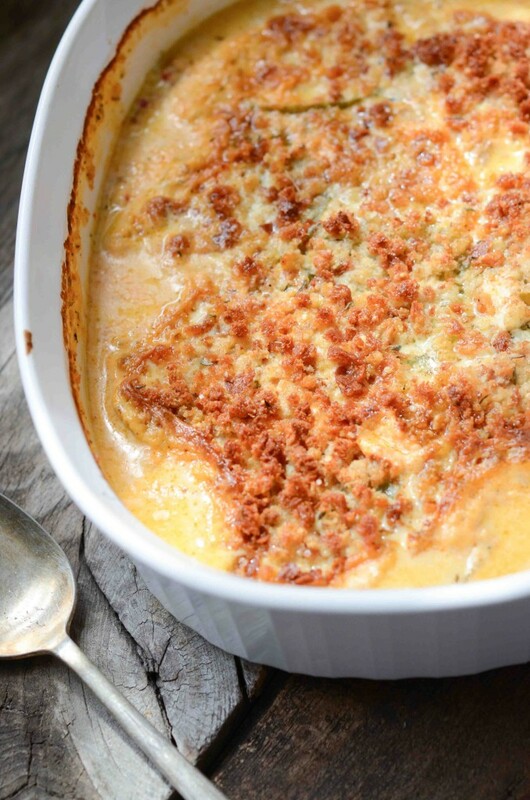 Isn’t that just the best name – gratin stew? 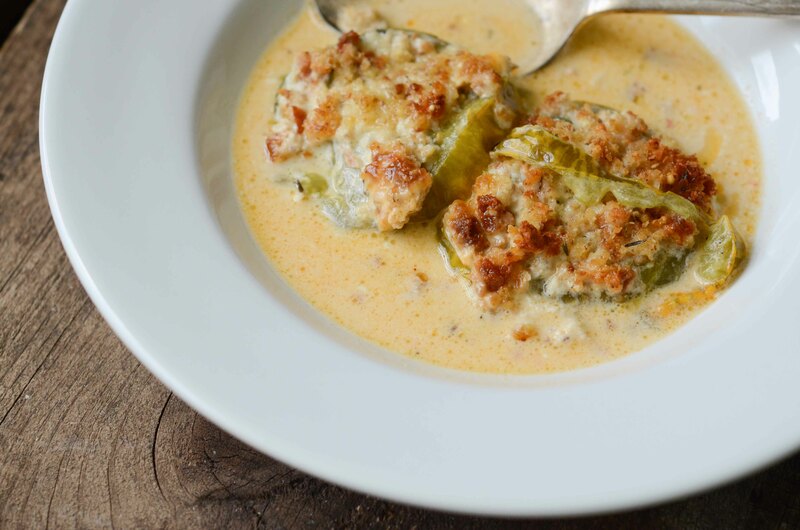 J’adore a creamy tomato soup, a little bit sweet, so I think of this as a warm version of Imen’s growing-up favorite meets baked cream of tomato soup. You can certainly keep it as pared down as the original recipe, but after making this a few times, I do like it with a bit of garlic and fresh herbs. I used gluten-free bread for the topping which worked just fine. I think you could also skip the bread topping and serve this over a piece or two of hearty, toasted bread, or a slab of warm corn bread, plunked down right in the middle of your bowl. The cream reduced with the tomatoes’ juices is truly divine and worthy of something starchy to sop it up. That said, if avoiding things starchy – as I generally do – creamy tomato juice on a spoon alone is perfectly loverly. Serve with a crunchy salad to balance the soft, warm richness of the tomatoes. For Tomato Party Part I, see my recipe for Green Gazpacho with Fried Shrimp (below). Preheat oven to 375 degrees F. Lightly butter a tart pan or shallow casserole dish with 1 tablespoon of the butter. Cut 2 tablespoons of butter into small pieces and set aside. Sprinkle the minced garlic over the bottom of the dish. Add one layer of tomatoes. Sprinkle with some of the fresh basil, a bit of salt, a few grinds of pepper, and dot with a few pieces of the 2 tablespoons of cut up butter. Repeat layering and seasoning the rest of the tomatoes. In a small bowl, whisk together maple syrup and cream and pour over and around the tomatoes. In a medium skillet set over medium heat, melt the remaining 1 tablespoon of butter. Stir in the bread crumbs, thyme, and salt to taste. Pat breadcrumb mixture on top of the tomatoes. Bake for 45 minutes to 1 hour, until breadcrumbs are golden brown. Let cool for 10 minutes before serving in shallow bowls, with spoons.